The Temple Hill apartments offer a comfortable yet stylish lifestyle right in the heart of the community. With a wide range of amenities and an efficient 745 square foot room plan, each airy one-bedroom apartment provides the perfect home for individuals and families. Temple Hill also offers a limited number of 2-bedroom and 3-bedroom units. With a history richly steeped in the Revolutionary War, New Windsor today offers a solid mix of cultural amenities, historical sites and modern comforts. Home to Stewart International Airport and close to St. Luke’s Hospital, New Windsor residents enjoy abundant local shopping options, attractions like Storm King Art Center and the New Windsor Cantonment State Historic Site, the popular Marasco Center for Seniors and a great many transportation, dining and recreation opportunities. Set in a wooded park-like setting, yet less than a half mile away from two major grocery stores and bus transportation to everything from Woodbury Commons to New York City, Temple Hill offers a laid-back, pleasant atmosphere with convenient access to many attractions. Smoke-Free Residential, Central A/C, On-site Laundry Room, Security Cameras, and Community Room, On-site Management. 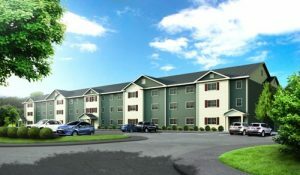 For more information on these units in New Windsor, NY and / or to find out what units are currently available to rent, please call our sales office at 845-563-0753 or click for an application.